Please note: Completed application forms are required – not CVs. Term: ONE-YEAR FIXED-TERM CONTRACT with possible extension, subject to funding. Experience required: At least two years’ relevant administration experience. 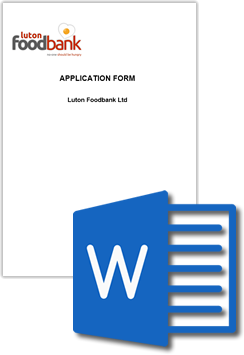 Purpose of post: To provide a comprehensive administration and reception service to underpin an efficient and effective food bank for Luton. Receive and respond to a wide range of visitors, donors, volunteers and occasional clients. Able to work well under the pressure of concurrent demands. Relate well to potential and existing volunteers. In liaison with the Project Manager, arrange induction sessions. Maintain records of potential and actual volunteers, and ensure all necessary paperwork is completed and filed. In liaison with the Warehouse Operative, maintain rotas for warehouse, distribution, and food drives. Manage a team of admin volunteers. 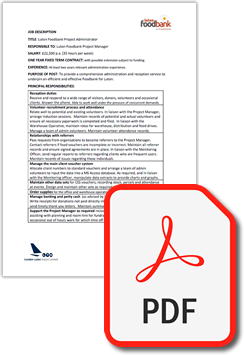 Pass requests from organisations to become referrers to the Project Manager. Contact referrers if food vouchers are incomplete or incorrect. Maintain all referrer records and ensure signed agreements are in place. In liaison with the Monitoring Officer, send regular reports to referrers regarding clients who are frequent users. Maintain records of issues regarding these individuals. Allocate client numbers to standard vouchers and arrange a team of admin volunteers to input the data into a Microsoft Access database. As required, and in liaison with the Monitoring Officer, manipulate data extracts to provide charts and graphs. …for Crisis Support Scheme vouchers, and for recording stock, food parcels, and attendance at events. Design and maintain other sets as required and produce reports. …for the office and warehouse operations, fundraising and other events. Write receipts for donations not paid directly into our account. Bank these items and send timely thank-you letters. …including general secretarial duties, assisting with planning and room hire for fundraising and other events, and occasional out-of-hours work for which time off lieu will be given. Luton Foodbank began distributing free emergency food parcels for people in hardship in the local community from 2 April 2013. The food bank is a charity overseen by a board of directors/trustees, and run by three full-time staff—a manager, an administrator, and a warehouse operative, with two part-time assistants, and supported by a core team of regular weekly volunteers with a wider group of occasional volunteers. Luton Foodbank works with a network of referral agencies, and distributes food five days a week, from several locations across the town—but not from our office/warehouse. Since launching, over 40,000 food parcels have been given to people in crisis across the Borough of Luton. This gives an outline of the skills and the characteristics required to do the job. Essential: without which candidate would be rejected. Desirable: useful for choosing between two good candidates. Please make sure that you give clear examples in your application of how you meet the essential and desirable criteria. This post is subject to a Disclosure & Barring Service (DBS) check. 12 noon, Monday 1 April, 2019.